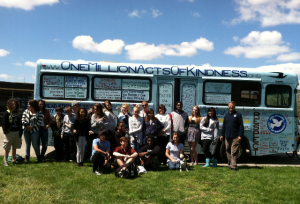 One of two schools in Yellow Springs, Ohio that has taken the One Million Acts of Kindness challenge for the year is Yellow Springs High School. I spent the day on this campus, giving in classroom presentations and presentations outside by the Blue Bird of Kindness. What a great connection and what a great group of students. A wonderful article written by Sarah Hawley about One Million Acts of Kindness was in the Athens Messenger. Please take the time to read it. This entry was posted on Thursday, April 24th, 2014 at 9:12 am	and is filed under Kindness. You can follow any responses to this entry through the RSS 2.0 feed. You can leave a response, or trackback from your own site.